GERMANY recently announced its annual campaign for the year - German Summer Cities, which aims to inspire travellers to choose Germany as their preferred destination for their summer holidays. The multi-channel German Summer Cities campaign, which is being rolled out throughout the German National Tourism Board’s 31 offices around the world includes comprehensive digital marketing, pop-up events and a wide range of other activities. We spoke to Sigrid de Mazieres, director, Gulf countries, German National Tourist Office (GNTO) in Dubai, for more insight into outbound travel from the region into Germany this year. What is Germany promoting this year at ATM? The German National Tourist Board (GNTB) is very much looking forward to its participation at the ATM, which is a key highlight and fixture in our annual marketing calendar for the region. As every year we will have a great line up of German partners exhibiting at our stand, which will reflect the great touristic diversity Destination Germany offers. Apart of the local tourist board of Baden-Württemberg (SouthWest Germany), the Black Forest Highlands, the elegant spa city of Baden-Baden and the buzzing metropolis Frankfurt, we will also showcase the luxury Hotel Palace in Berlin, as well as one of Europe’s finest designer outlets OutletCity Metzingen. Has Germany seen growth from the Middle East in terms of numbers and dollars spent year on year? Our statistics sum up all GCC countries and evaluate only GCC nationals, not expats. In 2018 we had over 1.69 million overnight stays from the region and are positive about attracting more GCC travellers to Germany in 2019. The GCC is one of the top 15 source markets for Germany and the third largest non-European source market, after China and USA. The GCC travelling public is very important in regard to spending as well as the vacation length. GCC travellers tend to stay 11 nights on average and with 4,683 Euro per person and they spend comparatively more than other international travel audiences. Germany also remains a very popular destination for medical tourism, which results in longer stays with family members for medical treatments. The GCC travelling audience is of major importance for the German tourism industry and the local hospitality industry is very well-equipped to cater to visitors from the region. Looking to the future, the German National Tourist Board forecast 3.6 million overnight stays until 2030 from the GCC region. What are the events/roadshows (if any) lined up for regional travel agents later this year? The German National Tourist Board is very active in the region and regularly conducts sales calls in the GCC region – also with our German partners, to keep ‘Destination Germany’ top of mind. Our Dallal Fi Almania Roadshow is planned for October, where we will place a great focus on Saudi Arabia and to which we have newly added Al Khobar as well as Bahrain to seize business opportunities and unlock market potential. Are you ‘announcing’ something at ATM? The GNTB is celebrating this year the centenary of the foundation of the legendary Bauhaus movement in Germany, which was arguably the single most influential modernist art school of the 20th century. In addition, we will focus on our annual marketing campaign German Summer Cities, which aims to inspire travellers to choose Germany as their preferred destination for their summer holidays, and which draws on the unique atmosphere of the many great German cities, no matter if they stand for big city culture, fabulous shopping, roof-top bars and fancy restaurants or the many fairy-tale small historic towns with castles and parks in rural areas, nestled into beautiful natural landscapes, which can be found throughout all 16 German Federal States. We will also use the opportunity to strengthen our relations with the regional travel industry and raise awareness for our upcoming events in the GCC. However, the floor at ATM will be very much left to our German partners, it is their time to shine and all of them have great stories to tell. For example, Frankfurt highlight their new amazing architectural tourist attraction ‘the new old town’, right in the centre of the city, which was rebuilt and officially opened last year. Outletcity Metzingen, rated as No.1 outlet in Europe by ecostra, will promote their incredible shopping experience, which very much caters to the Arab travelling audience and who will talk about their 30 per cent brand expansion in 2019 and 2020. Against the backdrop that the New York Times recently described Baden-Baden with the headline ‘The Belle Époque meets the Age of Instagram”, the enchanting city located at the foothills of the Black Forest, will use ATM to promote that it offers next to distinct elegant understatement also a great contemporary appeal. The Black Forest highlands will highlight their unique natural landscapes and, and great family attractions like zoos and the tourist board of SouthWest Germany will use the occasion to generate noise among many other aspects for Europa Park Rust, who is launching a new water theme park Rulantica and new hotels in 2019. What are the key destinations you are promoting this year? Many GCC travellers have visited Germany many times, especially Southern Germany – namely Bavaria and the Black Forest area. Our aim as the German National Tourist Office is to highlight the great variety Germany has to offer all year round, and to inspire travellers to also explore all the other great places, like the North with its unspoiled coastline, the historic castles in Lower Saxony or our trendy German capital Berlin and its beautiful surrounding areas. Germany’s greatest USP is its diversity. 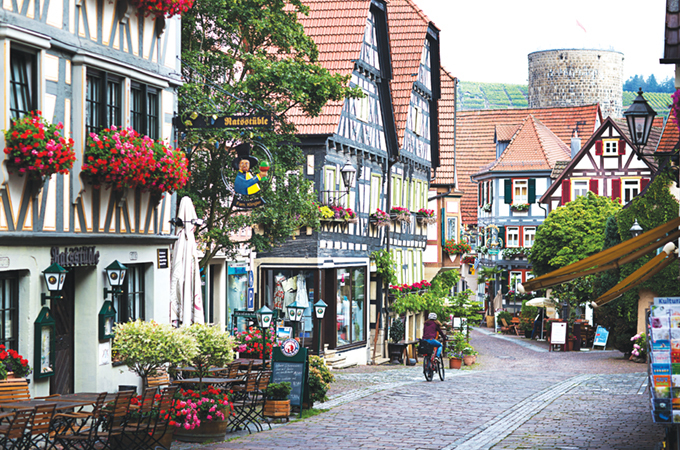 No matter if you prefer recreation and nature, sightseeing and entertainment in our many exciting cities like Berlin, Frankfurt, Düsseldorf or Hamburg, or shopping in our beautiful pedestrian highstreets or state-of-the art designer outlets for great value for money. Germany ticks all the boxes and what is also very important, in these modern times: our country is highly Instagrammable, too.